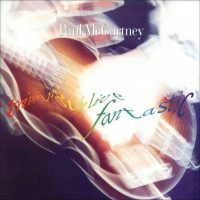 Released in the wake of Paul McCartney's 1989/90 world tour, Tripping The Live Fantastic was a triple LP, double cassette and double CD set. Just got back from the world tour and this is being written shortly after. From Rio to Glasgow, Tokyo through most everywhere and back again, this album captures some of the sounds of those nights on tour – when 'Spaceman' ran the red flag up, Curtis pushed the rig out and together with more than 100 others they staged the show. "Showtime" was the call and the shuffle through halls to backstage rituals nightly served to energise this merry band. And at soundchecks we played old songs from memory or made up pieces to keep ourselves amused. These "trinkets" are sprinkled throughout the album and hopefully convey a certain good humour. We saw fans with messages replying to our own ... we saw emotions and we saw hope for the future ... couples necking ... grown men crying ... children far too young to know ... and we played for all of them. McCartney performed 102 concerts during his world tour, playing to 2,843,297 people in 13 countries. All the American dates sold out, and the tour broke attendance records in several US stadiums. McCartney also outsold Madonna and Janet Jackson, who were touring at the same time. Eighty-three of the shows were recorded by Jeff Cohen using a 36-track digital mobile studio, and at least one song from every major territory was included on Tripping The Live Fantastic. At the end of the tour Pete Henderson listened to the recordings, and he, McCartney and Bob Clearmountain selected the best performances. Although no overdubbing took place in post-production, occasionally a better vocal or instrument performance was 'flown in' from another take, to present the best possible version. What we tried to do with the album was to give people a chance to take home with them a souvenir of the show; a better quality bootleg of what we hoped was just a good, fun, party night out. Soundchecks were recorded during the tour, and resulted in group compositions Inner City Madness and Together, as well as cover versions of Matchbox (Carl Perkins), Sally (Gracie Fields) and Don't Let The Sun Catch You Crying (Joe Greene). Other covers from the actual concerts were a snippet of If I Were Not Upon The Stage (a 1947 music hall number by Thomas Sutton, Stan Bowsher, and Bill Turner), Crackin' Up (Bo Diddley) and Twenty Flight Rock (Eddie Cochran).